OSHA updated its booklet Employer Rights and Responsibilities Following a Federal OSHA Inspection. The hefty publication describes the steps employers should take after receiving a citation and notification of a penalty, and can serve as a discussion guide during the closing conference with the OSHA compliance safety and health officer (CSHO). Any penalties that the area director issues. OSHA points out that the compliance officer is a highly trained professional who can help employers to recognize and evaluate hazards and suggest appropriate methods of correcting violations. Employers should work to correct hazardous conditions as soon as possible. Follow-up inspections and failure to abate. Display the official OSHA Job Safety and Health — It’s the Law poster. Inform workers about chemical hazards through training, labels, alarms, color-coded systems, chemicals information sheets, etc. Provide safety training to workers in a language and vocabulary they can understand. Perform required tests in the workplace, such as air sampling. Provide required personal protecting equipment at no cost to workers. Post OSHA citations and injury and illness data where workers can see them. Notify OSHA within 8 hours of a workplace fatality or within 24 hours of any work-related inpatient hospitalization, amputation, or loss of an eye. Not retaliate against workers for exercising their rights under the law, including the right to report a work-related injury or illness. 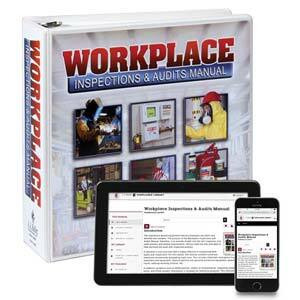 J. J. Keller's Workplace Inspections & Audits Manual gives the information you need to find and correct potential OSHA violations.